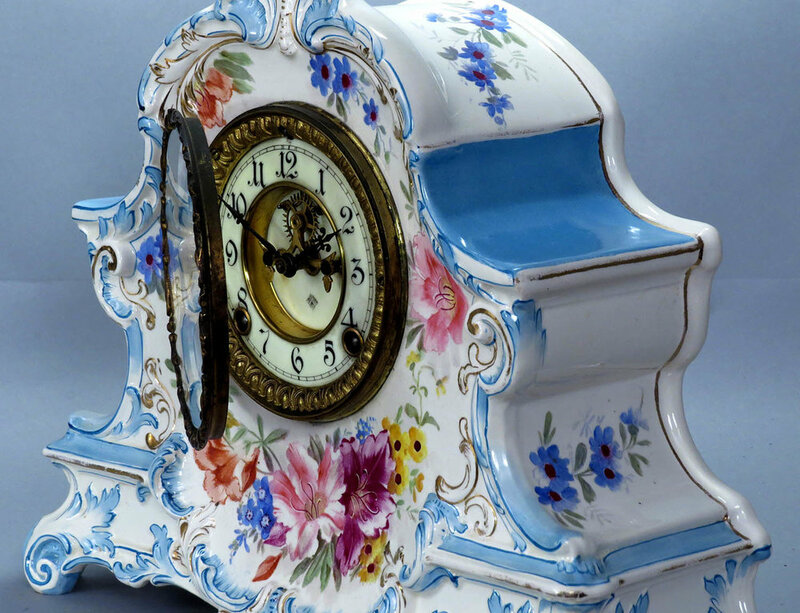 9076 Ansonia La Charny Royal Bonn porcelain clock. This clock has a beautiful multicolored case which is perfect, without any chips or hairlines. It has gold highlights and a good Royal Bonn signature on the back. This is one of the larger, more desirable case sizes. It has a signed porcelain dial which is also perfect, without any defects. There is a cast brass bezel with a thick beveled glass. It comes with the original hands, pendulum and key. This is an eight-day clock with hour and half-hour strike on a gong. It seems to be in good running order. This is a very pretty clock with light blue panels, floral decoration and gold highlights. I believe the case is perfect without any chips, cracks or hairlines. It has a two-part porcelain dial which is signed and perfect without any blemishes at all. This model has the desirable open escapement. It has a heavy embossed cast brass bezel with a thick beveled glass. The clock retains the original hands and brass pendulum. It has the red Royal Bonn stamp on the rear. The tin rear cover is missing. This is an eight-day clock with hour and half-hour strike on a gong. It runs a short while for me before stopping. 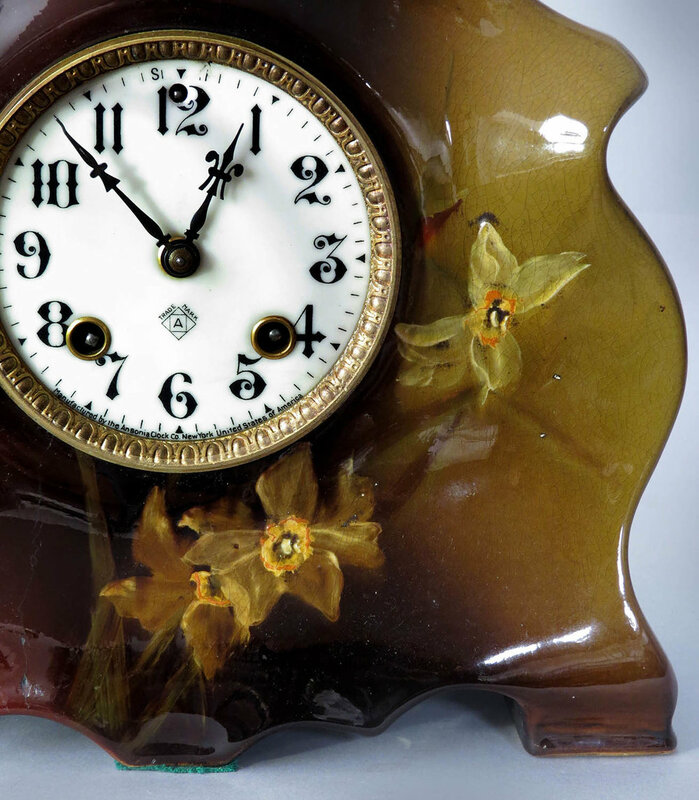 9079 Ansonia Willow porcelain clock. 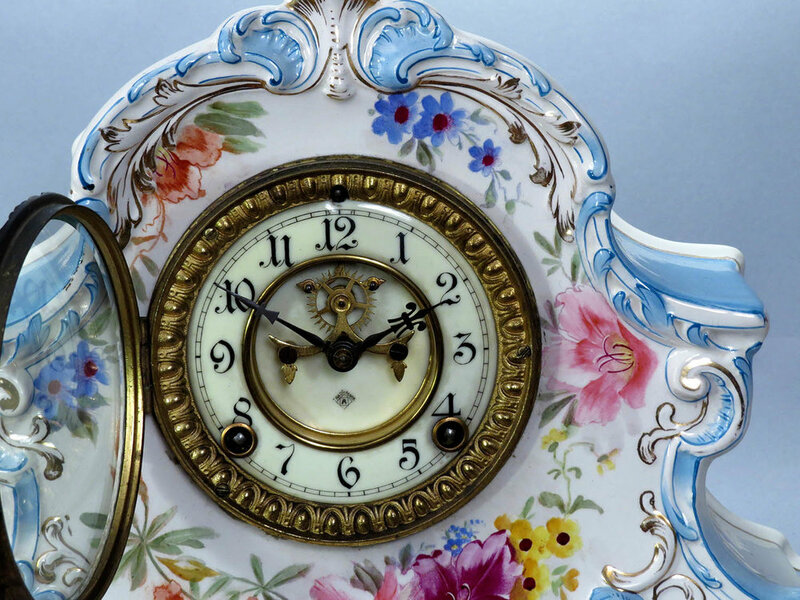 This clock has a very pretty rose-colored case with floral patterns plus gold highlights. The case is perfect without any chips or hairlines. The porcelain dial is signed and in perfect condition without any flaws. It has an ornate cast brass bezel and a thick beveled glass. The clock retains the original hands, pendulum and key. The model name is stamped on the back. This is an eight-day clock with hour and half-hour gong strike. It runs a short while for me before stopping. 9080 Gilbert No. 430 porcelain clock. 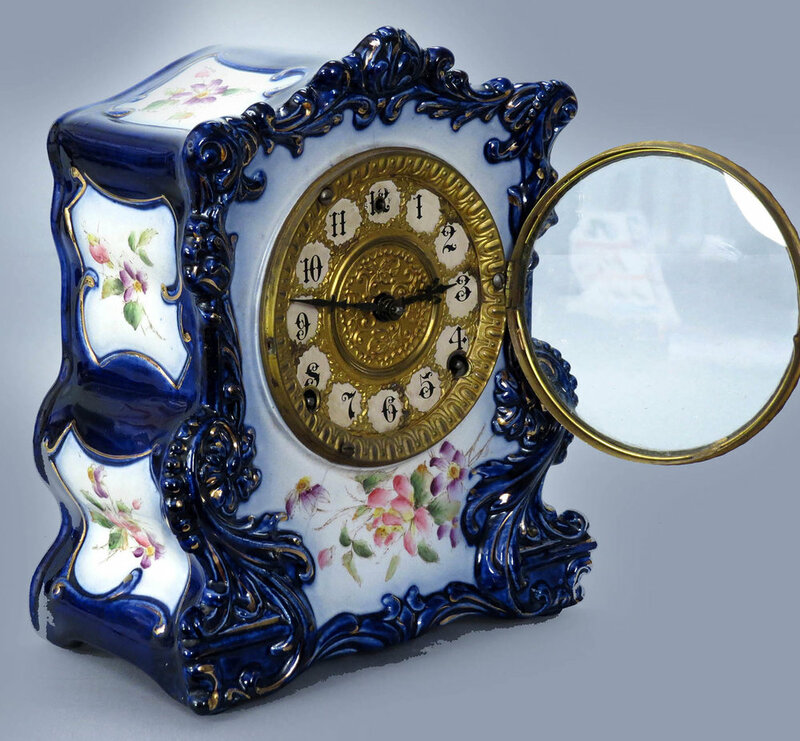 This clock has a beautiful cobalt blue case with floral panels and gold highlights. The case is near perfect with one very small flake on a rear edge, visible only from the back of the clock. It has the original dial paper behind a pressed brass mask and a pressed brass bezel. It retains the original hands and pendulum. The model name is stamped on the rear of the case. This is an eight-day clock with hourly strike on a gong and half-hour strike on a nickel bell. It runs a short while for me before stopping. 9081 Ansonia La Gard Royal Bonn porcelain clock. This clock has a very pretty case of light blue with colorful flowers. All of the colors are very bright and crisp and the case is perfect without any chips or flakes. There is a good Royal Bonn stamp on the back. The signed porcelain dial is perfect, without the slightest hairline. The cast brass bezel has a fine engraved edge and a thick beveled glass. It comes with the original hands, pendulum and key. This is an eight-day clock with hour and half-hour gong strike. It is running. I could not find this model illustrated in the Ansonia catalogs. This is an unusual, unsigned case with a beautiful, rich chocolate color on the front, sides and back. There are floral highlights on the front and the case is perfect without the slightest blemish. It has a signed porcelain dial which is perfect without any flakes or damages. The cast brass bezel has a finely engraved rim and a thick beveled glass. It retains the original hands, pendulum and key. The wood bottom board has been replaced because the original probably cracked. 9083 Gilbert porcelain mantle clock. This is a very unusual case design but it has a very pleasing appearance. The waterlily design against a dark green background has a great Art Nouveau look. I could not find this model illustrated in the Gilbert catalogs but the back of the case is marked 440 and Gilbert did mark their clocks with that numerical system. The case is perfect, without any chips, cracks or hairlines. The dial paper is a celluloid type replacement to resemble porcelain and it looks fine. The bezel is embossed pressed brass. The hands and pendulum are the originals. This is an eight-day clock with hourly strike on a gong and half-hour strike on a bell. 9084 French porcelain mantle clock. This clock has a cream colored background with a multitude of colorful floral decorations and gold highlights. It is a bit smaller than normal so it will be an easy fit for most situations. The case is perfect, without any chips, cracks or other issues. It has a very nice porcelain dial which is also perfect. There is a cast brass bezel with a beaded edge and a convex glass. The hands are the originals. This is an eight-day clock with hour and half-hour strike on a cathedral gong. It is running but I do not think the movement has been cleaned in quite some time. 9085 Ansonia Royal Bonn La Ramba porcelain clock. This clock has a very pretty light blue case with colorful floral decorations and gold highlights. The case is perfect, without any chips or other problems. It has a pressed brass bezel with a beaded edge. The paper dial is in very good condition behind an ornate pressed brass mask. This clock has the original hands and pendulum plus a good red Royal Bonn stamp on the back. This is an eight-day clock with hour and half-hour strike on a gong. It is running. 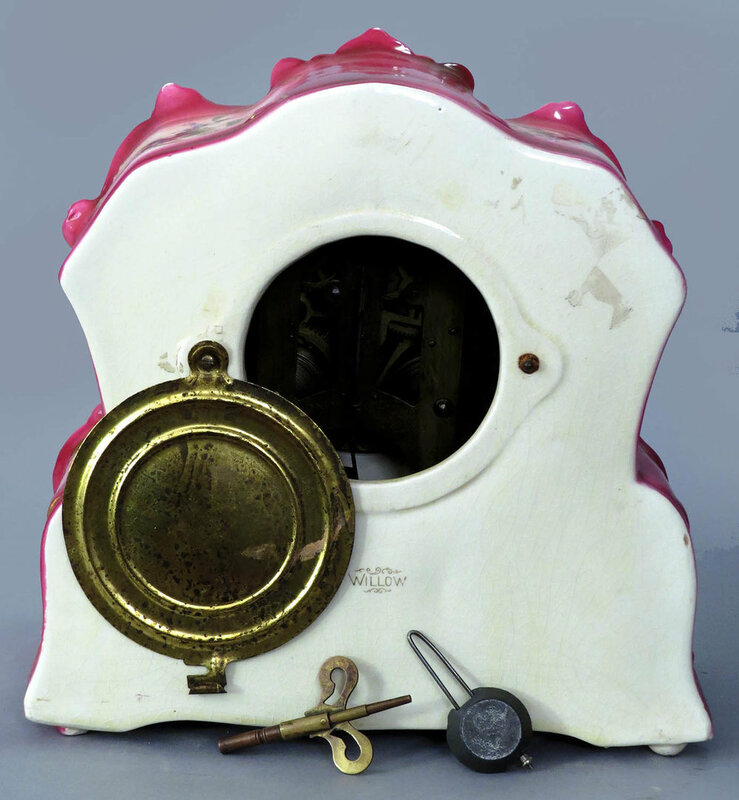 9086 Ansonia La Cruz Royal Bonn porcelain clock. 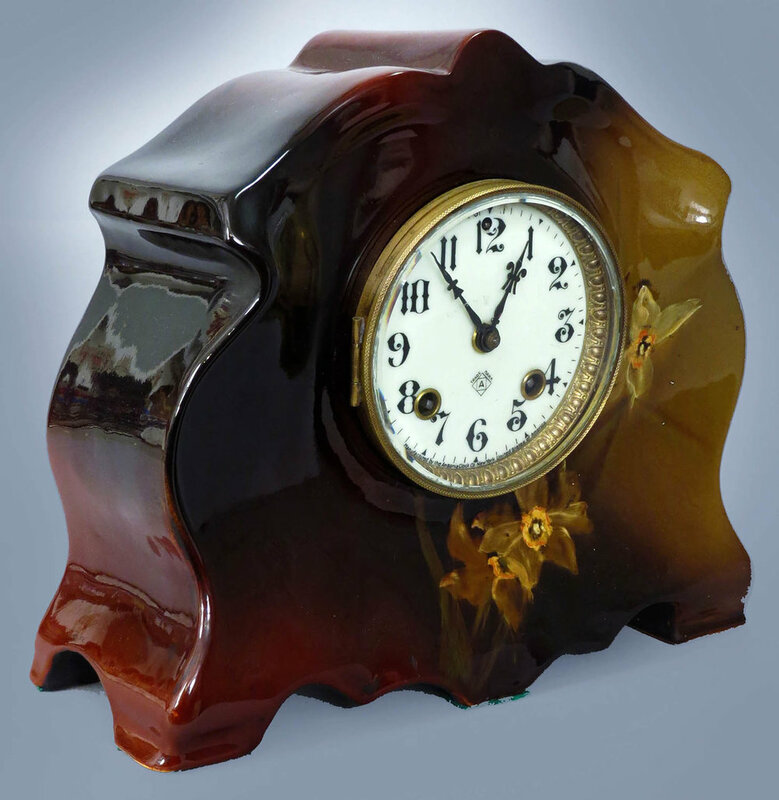 This clock has a simply beautiful rose-colored case with a great design. There are colorful floral panels plus a great deal of gold highlighting. The case is perfect, without any problems at all and it has a good Royal Bonn stamp on the back. The bezel is very ornate heavy cast brass with a nice, bright color. That is matched by an ornate cast brass dial surround. The porcelain dial is signed and perfect without the slightest imperfection. It comes with the original hands and brass pendulum.